Blog Commenting - Have It or Not? Blog Commenting – Have It or Not? I thought the value of blog commenting is obvious but… I still encounter blogs with closed comments section so I decided to share my thoughts on the topic. Read on. If you are a regular blogger, chances are you spend quite a lot of time not only researching and writing your content but promoting it, too. So what a better way to attract and keep readers than let them speak their mind and converse with you? Here are a few reasons off the top of my head about why leave blog commenting open to everyone. We all have busy every day routines (I suppose) so the moment you ask me to register to your blog to leave you a comment, you lose me. Make it easy for your readers to speak their mind – and they will 😉 Leave blog commenting open to everyone. Not one or two of my posts are as a direct result of readers’ comments. After all, when a reader asks a question in the comments, there’s a good chance more readers are asking themselves the very same question. So why not blog about it?! If my comments were closed, I might have never thought to answer the questions which I never got asked in the first place. Provided your content is good, readers will follow, it is inevitable. But how do you know your readers are there? 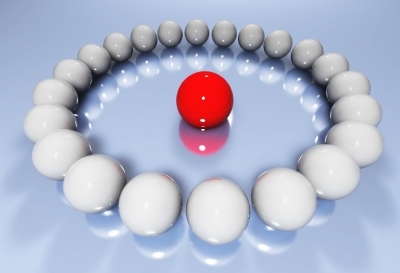 How do you build upon your existing readers to attract new ones as well? Blog commenting helps you with that. When I find a new blog, I usually check if there are comments on the blog posts, what type of comments, are there author’s replies to the comments, etc. This information helps me decide what type of blogger I am about to interact with and what type of readership the blog has. I already mentioned the busy daily routines we have – I am no exception. So if I see more negative comments or rude replies by the author to valid questions or remarks, I move on. I find blogging (and blog commenting) to be a great adventure of meeting and interacting with new and interesting people. So I am not wasting my time interacting with people, whose responses I don’t like or who treat poorly their readership. And I am not talking about occasional comments like “great post, keep up the good work” and such. Those we can all leave to everyone and anyone. I am talking about meaningful comments which bring value to the blog post itself and to the conversation. 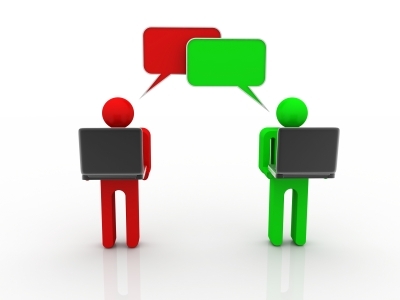 Check out one of my first posts – dos and don’ts of blog commenting. Imagine you go to a blog post with zero comments – would you leave one? Maybe… if you are super loyal reader of that blog and you really have something smart or interesting or funny or inspiring or else to say. Now imagine if you go to a blog post and there are some comments on it but you need to register with the blog, then verify your email, then answer a few questions and only then, your comment goes into moderation and it may or may not be approved. Would you go through this cumbersome process only to leave a comment? I don’t think so. I know I wouldn’t. Bear with me – last one. Now imagine you go to a blog post with some comments and it is super easy to leave your comment. You just type in your name, email, (URL if you want), comment – and viola. Some blogs are even smart like that – they remember you, if you return to leave another comment in time. How cool is that?! So then would you leave a comment? I will not bore you with technicalities but there are plenty of ways to make blog commenting easy for your readers. I have seen on other blogs services like Disqus and IntenseDebate which do a pretty good job when it comes to making it easy to readers to leave comments – with or without social media profiles integration. But I can say that Akismet has been pretty accurate so far and even if there are some hiccups around major WordPress and/or Akismet updates, those get resolved fairly easy with a quick email or two to white-list the email address which has triggered spam filters for no apparent reason. So tell me in the comments – do you have blog commenting open to everyone? What use do you see from blog commenting? I have never closed comments on any of my posts. I doubt I ever will, either. I think that freedom of speech should be encouraged. However, I do have certain rules for those who wish to comment on my blog. They’re simply common sense ones; like no swearing and posting links (there’s a time and place for that). Google ranks pages according to what the content is in the post and also what the content is in the comments. 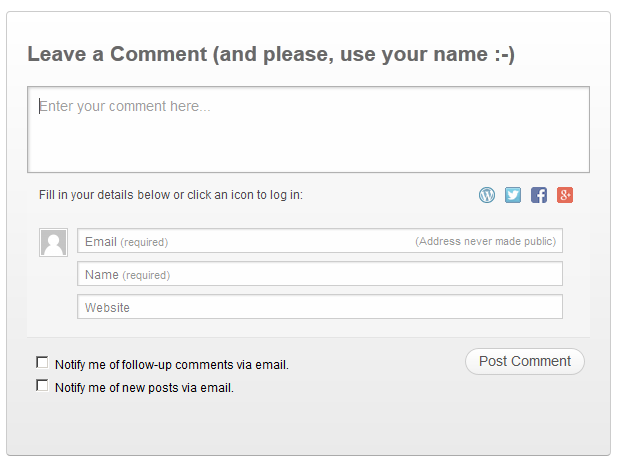 If comments add value to the post, it’s better for you, and if someone leaves an unrelated comment, you are penalized. Commenting is encouraged by many bloggers, although I’ve run across a few who are for closed comments. There was a post on Dear Blogger about this a couple of months ago. I cannot recall their reasoning for being pro closed commenting, but I know that some of the points they made did, indeed, make sense. However, even though I might agree with them, I feel more strongly towards open commenting. Thanks for your comment, Lorraine! Great idea for a post, Diana. I encourage comments and enjoy when a real dialogue gets going. I wish bloggers who use it would top making people fill out the Captcha form that requires you to type in unintelligible letters and numbers. I never get it right the first time and will give up after 3 tries. Captcha discourages comments. It’s much more user friendly to simply have a box to check that you are not a spammer. While on the captcha topic – i too like the check-box “i am not a spammer” confirmation – but i never knew how to put it there, maybe a plugin, maybe something else. Truth is, that my Aksimet is working pretty well – i don;t have problems with spam although i use neither captcha, nor check-box or other anti-spam challenge for comments. how cool is that?! Thanks for stopping by, Jeannette! Closing comments on my blog post would make me feel guilty as if I have put my blog post on ventilator. Comments make our blog live and I don’t have any intention or plans to close my comments, at least not till date. After all, commenting is a simple tool to debate and make our posts interactive. Many points do pop up during the interaction that might not have been covered in the blog post. I completely agree on the point that commenting helps us get new ideas that can be later on dealt in another post separately as a new topic. I consider blogging being dynamic due to its commenting feature and without comments, a blog would feel like a boring static website, which is only used to push the thoughts of the author. Readers must be given a fair opportunity to question and even challenge back the thoughts expressed by the authors. I totally agree with you, Ashutosh – i am happy to see we are on the same page! Thanks for reading and commenting on my blog! You mentioned building an engaged community. That is an excellent reason for keeping comments open. Reader engagement can be a key element in driving traffic to our sites. I don’t see too many blogs with closed comments, other than blogs on news sites where sometimes the comments can turn ugly. Then again, most of the sites that I visit are from bloggers like you who recognize the value of fostering communication and building relationships. I’ve been using CommentLuv Premium for years now and I’m a huge fan. For a short while (about a week) I turned off the do-follow feature because I was in the process of a massive link cleanup. I’ve now turned that back on. Quite a bit of my traffic comes from other blogs that also have CL installed with the do-follow tag active. You’re absolutely right about CommentLuv creating more work. Spammers are definitely attracted to the do-follow attribute. You’re also correct that lots of links that are left in comments are good but eventually can result in 404-errors or even worse links to bad neighborhoods. CL definitely contributed to my losing organic search traffic due to the Google Panda, Penguin and Wooly Mammoth updates but I blame myself for that not the plugin. I knew I should have been more diligent about cleaning up links than I was. It’s a catch-22 though. I have over 10k comments on my blog and I believe that I would have a fraction of that if not for CL. So, it’s a tradeoff. To me, it’s still worth using. As for GASP, there’s also a free stand-alone version available (as there is CL). Even before I installed CL, I replaced Akismet with GASP. Although, at the time Akismet was not as effective as it is now. I love receiving comments on my blog. The comments are often the best part of my blog. They are where ideas really take off. I love seeing what people do with the ideas that I put out there. There are so many life experiences and so many perspectives that the comments add a dimension that no one person could ever achieve on their own. When I see a blog with closed comments I often wonder what the point of creating the blog was. Why not just keep a journal or a word document if you don’t want to interact? Yet another great post! I always open my comments. I love engagement and I feel that an empty and quiet blog is rather boring in fact. And commenting is also a great way to build more relationship between your readers too.